Does Germany have a trade union problem? Germany is the kind of country where the trains run regularly, and on time. But not earlier this month, when train drivers walked out for the longest strike in the history of Deutsche Bahn; the company that owns the German railway. It is not the first time they have done so; for months they have been in an increasingly aggressive dispute with their employer. The union which represents them, GDL, is demanding a 5% pay rise on their behalf and the two sides are deadlocked - despite intervention from German Chancellor Angela Merkel. The six-day industrial action is estimated to have cost German business €500m (£360m; $570m). As that strike ended, another began. Kindergarten staff walked out in a dispute over pay. Postal workers are threatening industrial action too. And it is just a few weeks since pilots at the national carrier, Lufthansa, staged the latest in a series of strikes. "The tradition in Germany has been for unified trade unions, which try to organise all employees in one branch," says Jens Schubert, a lawyer for Verdi, one of the country's largest trade unions. "The new tendency is we find more and more so-called craft unions - unions which represent only one part of a company or branch, like doctors or pilots." 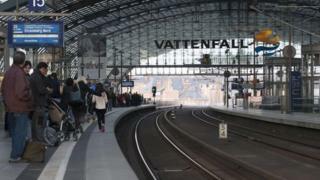 In the case of the railway workers for example, the strikes have been called by the GDL union, which represents around 19,000 train drivers at Deutsche Bahn. But far more of its employees are represented by another, more general transport union - EVG. Nevertheless, GDL - like many other craft unions - has become a powerful voice, able to cripple Germany's rail network, despite not representing the vast majority. It is tempting to wonder whether this spate of strikes represents a change in attitude among German workers. But the number of days lost to strike action is actually decreasing. And workers here are far less militant than those in the UK and France. Some six million people belong to trade unions in Germany in 2014, similar to the 6.5 million trade union members in the UK. But they go on strike far less frequently than their European counterparts. IGM (Industriegewerkschaft) is the largest trade union in Germany - in fact it is the biggest organised representation of workers in the world - 2.2 million workers. During the same period France lost about 139 days a year, Denmark 135, and Ireland 28. Nevertheless, the type of representation they are choosing has changed. And, as Karl Brenke from the German Economics Institute points out, that is having an effect. "In the last decade, Germany's large trade unions were accused of being too modest and not fighting hard enough for higher salaries. So, as a result, wages didn't match inflation or productivity. "Now, the smaller unions do that and there is a knock-on effect on the bigger unions - they will have to be more aggressive to remain attractive." The German parliament is due to consider legislation which would - many argue - limit the power of the unions. The law is expected to be finalised this summer and it will restrict union representation in a company; just one union will be allowed to represent a group of employees. Because it would have to represent the majority of workers, it would likely squeeze out smaller unions. So, in the case of the train drivers, GDL would most likely be replaced by the larger, more generalised union. You would think, in its position as one of Germany's trade unions, Verdi would approve. Instead, Jens Schubert explains: "We fear that if we have an act like this, it's clear there'll be something written down about the system to go on strike. "We have to avoid legal actions that could minimise the right to go on strike." Meanwhile the trains are running again. But there is no deal in sight between GDL and Deutsche Bahn. And now EVG is demanding higher pay too. Neither will rule out future strike action.